When exactly did publishing restart on Okinawa itself? Actually, in 1953, a total of twelve articles on Karate/Kobudō were verified in Okinawan newspapers or magazins. I want to add two articles here, which hitherto had not been identified. In addition, they are not just some random articles. Rather, they appear to be the two first postwar articles written on Karate/Kobudō and published in Okinawan newspapers or magazins. 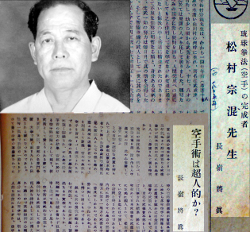 The apparently two earliest articles on Karate/Kobudō published in post-war Okinawa, written by Nagamine Shōshin of Matsubayashi-ryū (photo and articles: from the archive of the author). In this article, Nagamine first published his pre-war research on Matsumura, his visits to the family, the boddhisatva he found in the family alcove, the original Matsumura family genealogy, a letter to Matsumura written by Ijūin Yashichirō, a samurai from the Satsuma fief, expert of the Jigen-ryū of sword fencing, who also granted Matsumura a menkyo kaiden (certificate of full initiation into the art) in this sword style after only half a year of practice. In many respects this 1952 article – with its personal interviews, original field research, and oral traditions handed down – is still a gold standard on Matsumura Sōkon. Whoever may attempt to update, expand, or rewrite the history of Matsumura is doomed to fail if not counting in this article of Nagamine. This entry was posted in Unknown Ryukyu and tagged Funakoshi Gichin, Mainichi Shinpo, Matsubayashi-ryu, Matsumura Sokon, Nagamine Shoshin, Okinawan newspapers, The Restorer of Ryukyu Kenpo, two first postwar articles written on Karate. Bookmark the permalink.